I’ve been thinking a lot about goals lately, thanks to a few discussions with friends. 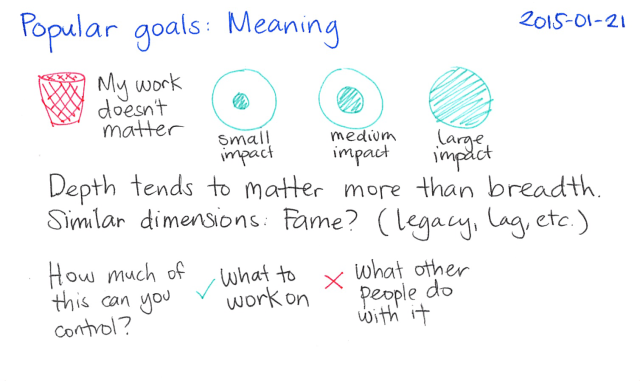 I don’t feel particularly driven by big, hairy, audacious goals (BHAGs). Instead, I focus on small wins and low-hanging fruit, accumulating progress. I don’t have a clear picture of exactly where I’d like to be in 40 years. Instead, I have a multiplicity of posibilities. But maybe I’m not a special snowflake, and I can learn from the kinds of goals many people have. It’s fun to put on a different hat and try things out. By trying on common goals instead of rejecting them off-hand, maybe I’ll figure out more about what I really want and how to get there. 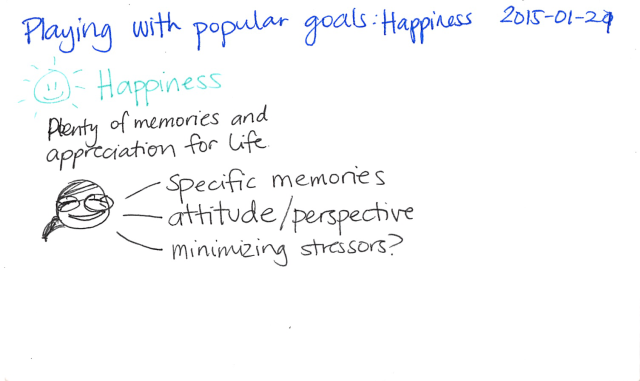 Aristotle says that happiness is the ultimate goal. I find it helpful to think of happiness as a response to life instead of as an external state to pursue, so this goal feels a little odd to me. But it’s interesting to imagine a happy 90-year-old Sacha and what that life would be like. I think it involves building specific warm-and-fuzzy memories, maintaining a good perspective, and minimizing stressors. 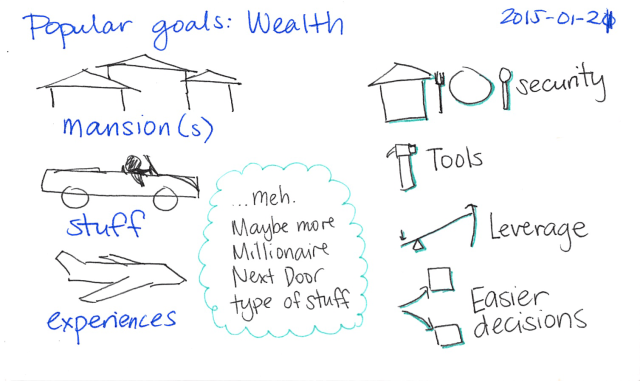 Let’s take a look at other typical goals: wealth, power, fame, and knowledge/experiences. This might be the easiest of goals to desire, since it’s popular and measurable. Based on my reading, I imagine that conspicuous wealth will bring more problems than I’d like, so I don’t aspire to high-flying lifestyles. I value freedom, so it makes sense to have a financial buffer and to avoid becoming too accustomed to luxuries. That increases my security, which allows me to do more experiments. (I’m already privileged as it is!) Tools can be good investments, and it’s great to be able to strategically use money to make a bigger difference. Money also makes decisions easier: instead of worrying about cutting into your safety margin, you can try things out and see what happens. 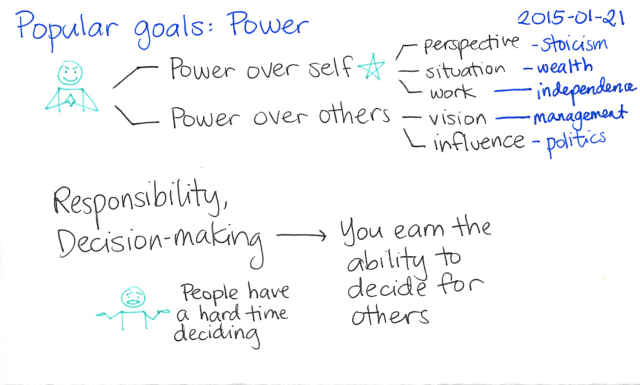 Power includes determining your life and influencing other people’s lives. I definitely care about having power over myself, but I’m not driven by the idea of making big decisions that affect thousands of people’s lives. 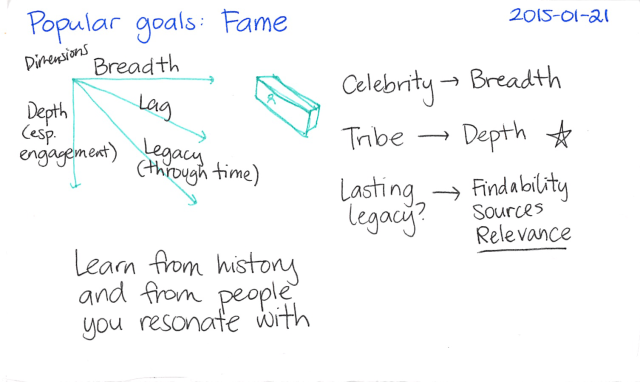 I think I care more about depth of connection (tribe) than about breadth of fame (celebrity). I’m not sure about legacy. On one hand, it’s good to do things that are remarkable enough to help or inspire people throughout the years. On the other hand, what do we do that will matter after a century, and how can we get things to even be remembered for that long? I’ll think about this a little more while reading history. What makes essays resonate with me even after all that time, and how can I also reach across the years? I like the goal of learning more so that I can appreciate life better, maintain my independence, contribute meaningfully, and make better decisions. 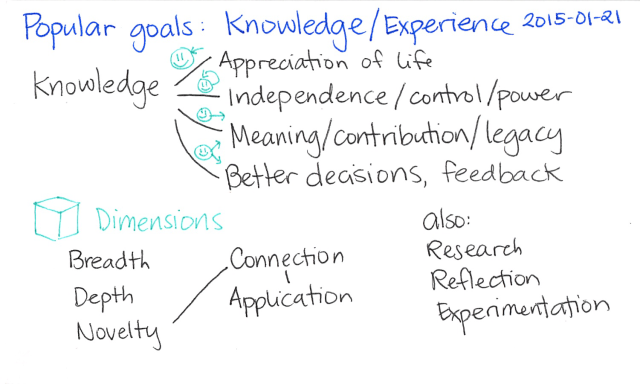 I focus more on knowledge in the sketch above, but I think the popular approach to this goal is to focus on experiences. Bucket lists are practically all about experiences: seeing this country, climbing that mountain. That’s why travel is so big, I guess. What kinds of experiences would I like to have if I were to travel more? I currently don’t like traveling, but it’ll probably be less of a hassle now that I’ve gotten my Canadian passport sorted out. Still, with J- in school and three cats at home, it’s hard to plan. Maybe this will be something for later. Besides, I’m not totally convinced that travel is the best way to learn these things. It was fun being immersed in a language and going to local shops. 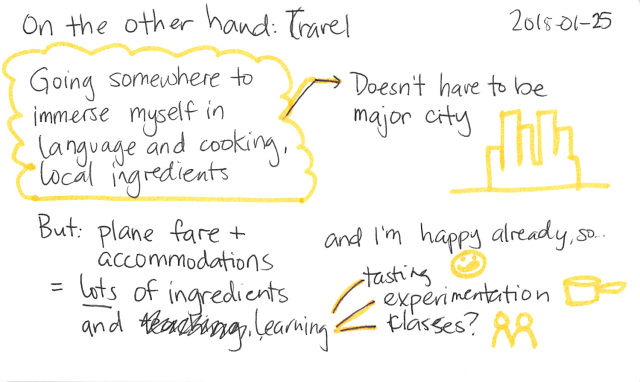 But traveling to learn more about cooking seems a little wasteful, since airfare alone will buy lots of ingredients (and even personalized cooking classes). Staying home means I focus on cooking dishes I can enjoy long-term, and I can take advantage of our kitchen setup. So there’s an advantage to staying home, too. 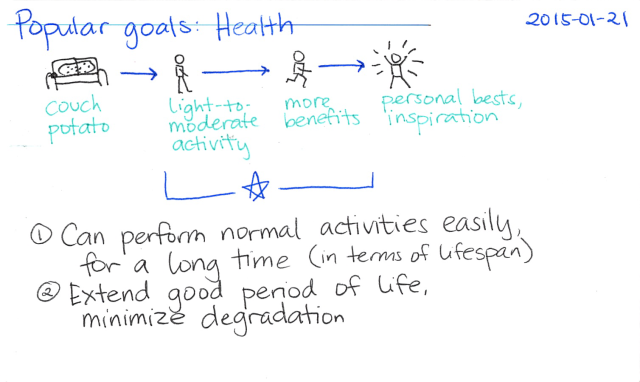 What about other intrinsic goals? Health makes sense, since your enjoyment of many things can be curtailed by poor health. I probably won’t strive for buffed-up awesomeness, though. I’m mostly focusing on functioning all right, with maybe a little effort here and there to do a bit better. People want to make a difference at work and in their relationships. Many people feel that their work doesn’t matter a lot. Despite the abstraction of my work (I move bits around? I crunch numbers and questions? I write tools for a tiny, tiny fraction of the world? ), I’m pretty good at convincing myself I have a small impact. =) Do I want to trade up by focusing on work that has a bigger impact (either for more people, or deeper in people’s lives? I don’t know yet. I like this goal the most. Stoicism tells me that it’s the one thing under my control. It transforms the ups and downs of life into opportunities for growth. It doesn’t mean that I can’t enjoy things, I just shouldn’t get so attached to them that I become afraid. It doesn’t mean that I can’t be sad, it means I can try to take a different perspective on things. Hmm. 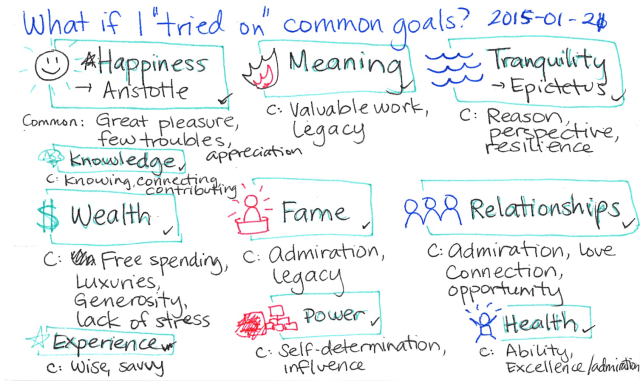 Trying on popular goals helped me take advantage of the collective centuries (millennia?) of thought that have gone into those goals. I still have to come up with my own specifics, but it’s good to be able to quickly test what resonates with me instead of trying to formulate everything by myself. 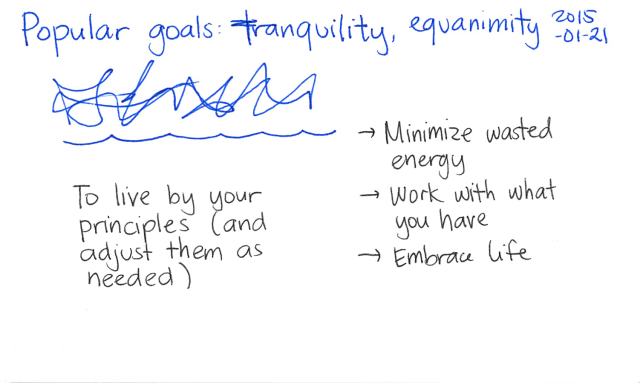 If tranquility, happiness, and knowledge are my major goals (with health as the goal I know I should have), I can focus on coming up with specific ways I want to explore those areas. Do you resonate with some common goals? What are they, and what are you learning from that?